The NSWXC Nordic Shelter Management Committee are seeking expressions of interest by persons interested in managing the Perisher Valley Nordic Shelter in 2017. Managing the Nordic Shelter at the Perisher XC Centre is one of the more interesting ways to fill a winter. NSW Cross Country is seeking expressions of interest from coaches to work with the NSW Junior Team and Athlete Development Program during the 2016 Southern Hemisphere winter, with the primary role being coaching athletes and coordinating the program. The program will be of approximately twelve weeks duration and will be based predominately in Jindabyne/Perisher, NSW, with travel to the Victorian resort of Falls Creek for races and training events. There may be a requirement to travel to Sydney for dryland training. Additional information is provided in the job description linked below. Interested persons should apply via email to NSW Cross Country Skiing Chair: (nswxc@nswsnowsports.com.au) by 12th Feb 2016, briefly addressing the key selection criteria. Please provide 2 references, with the contact details of the referees. Applicants may be invited to supply additional information and/or to attend an interview. The appointment will be made by a panel appointed by NSWXC. Position Title: 2016 NSW Development Program Manager/ On-Snow Coach. Contract Period: 23rd June 2016 to 10th September 2016. The 2014 Snowy Mountains Classic was held last Saturday August 9 at Perisher. The longest cross country ski race in NSW, the SMC is one of the highlights of Cross Country Ski Week that includes a swag of events and activities from August 2 to August 10. The winner of the 30km Freestyle event was Barbara Jezersek from Slovenia, and the first man was Petr Jakl from the Czech Republic (both of whom have been coaching/instructing at Perisher this winter). The full results of all distances, and most of the other races from Cross Country Ski Week are available on the results page of the Perisher XC website. For insight behind the scenes of Cross Country Ski Week read Wayne Pethybridge’s blog. Assorted results from the Boonoona Open on Sunday August 3. There were about 80 entrants skiing in 2.5km and 5km events in Classic and Freestyle. For more information on NSW Cross Country Week head to the Perisher XC site. There’s been plenty of racing action happening at Perisher so far this month. The latest events were the ACT Championships on Saturday July 12 and the NSW Championships on Sunday July 13. In the open women’s class Barbara Jezersek from Slovenia cleaned up the races in both competions, while in the open men Callum Watson won on Saturday and Cameron Morton won on Sunday. To find the results as soon as they are posted head to the Perisher XC Results Page. 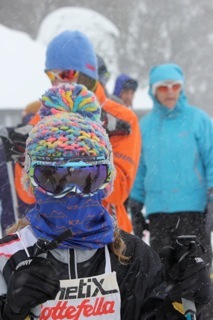 Thirty nine brave junior cross country skiers braved the wild and wintery weather to participate in the Paddy Pallin Juniors at Perisher on Saturday 28 June 2014. The snow was plentiful and so were the smiles, even with near blizzard conditions roaring across the ski tracks. Participants ranged in age from 5 to 15 years, with skiers competing over varying distances from 200 metres to two kilometres with multiple laps of the sprint loop at the Perisher Cross Country Ski Centre. The focus of the Paddy Pallin Juniors is to promote participation in cross country skiing and therefore skiers are only awarded their time taken to complete the course, rather than given a placing.